The short answer is Yes, Daily Fantasy Baseball is legal. See Daily Fantasy Baseball sites for info on where to play. Although I am an attorney, the information below does not constitute legal advice. Laws vary by jurisdication. Laws change. The simple act of you reading below does not mean I am your lawyer or I have given you legal advice. The information below is only my attempt to shed some light on the question: Are daily fantasy sports legal? 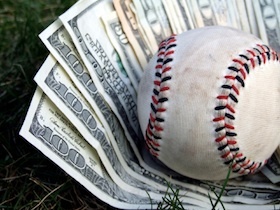 Daily fantasy sports certainly have similarities to betting on sports. You study the possibilities, the probabilities, and the odds. You put money at stake. A game is played that you do not control. You win or lose money. There are many similarities. The difference, in the eyes of the law, is that sports betting is pure chance. Daily fantasy sports are a game of skill. That is, in essence, what makes daily fantasy sports legal. In reality, dfs is more chance than people would like to admit and sports betting is probably more skill than people would like to admit. They are not far apart. But the big bright line of legality stands in between them. Almost as early as the Internet itself, online gambling became an issue. It was hard to regulate without eliminating various Internet freedom. Some said the Wire Act made online gambling illegal. Others said it was unclear. The Unlawful Internet Gambling Enforcement Act (the UIGEA) made it much more clear what was and was not lawful. Online sports betting and online poker, not deemed to be games of skill, were out. Daily Fantasy Sports were in, if certain criteria were met. Major league baseball and the National Football League have been huge proponents of fantasy sports in general. Though neither organization has daily fantasy, both heavily promote their own proprietary fantasy sports games. Fantasy sports encourages interest in the game. That produces revenue for the league. Representatives of the NFL have stated, “We just want the fantasy industry, as a whole, to grow as big as possible.” Presumably that means daily fantasy, as well. Even if it doesn’t, the UIGEA created a clear carve out for fantasy sports. Those fantasy sports mean literally billions of dollars for those with the power. Therefore, anyone trying to declare daily fantasy illegal is going to have to walk a razor thin line. Expect the answer to “Are daily fantasy sports legal?” to remain YES for the forseeable future. Throughout the country, you need to be 18 (the age of majority) to play daily fantasy sports. In both Alabama and Nebraska you must 19 to play daily fantasy sports. At this point, the systems to check both age and state of residency are not sufficient. Most daily fantasy sports sites don’t really check either. That said, it’s not right to violate the terms of a website and doing so can lead to problems later down the line. With the exception of the caveats above, all daily fantasy sports are legal, if operated correctly. There is no specific legality issues based on the different sports. Daily fantasy football, basketball, golf, hockey, and certainly daily fantasy baseball are all legal. What Sites Have Legal Daily Fantasy Games? It’s not to know our government got this one right, even if it was almost by accident. Compare online poker vs. daily fantasy sports… they seem to be either equally games of skill. But poker’s loss is daily fantasy’s game. Enjoy playing daily fantasy free of legality issues!